After a nice dinner at Dickey’s BBQ, my wife and I went and saw The LEGO Movie last night. 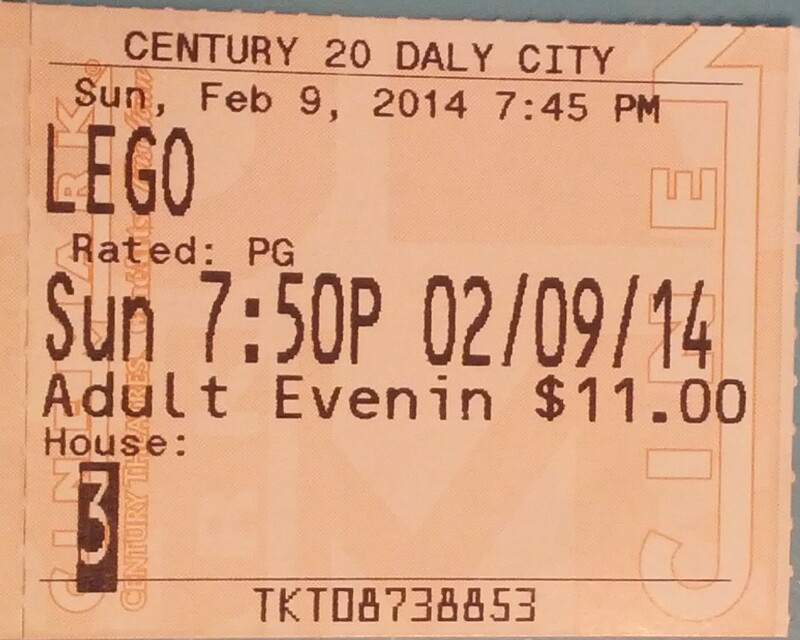 The LEGO Movie was one of my most anticipated films for 2014. I am happy to say that the anticipation paid off. The film stars LEGO mini figures in a LEGO world voice acted by such amazing talent as Liam Neeson, Will Ferrell, Morgan Freeman, Cobie Smulders and Will Arnett. I liked the fact that the film was able to utilized licensed LEGO products to bring Gandalf and Dumbledore together with the Justice League and a Unicat. Shaq and an 80’s Astronaut round out some of the cast of heroes, who along with an everyman construction worker go up against the Evil Lord Business and his Bad Cop/Good Cop sidekick. The movie travels across different walled off areas of the LEGO universe with different themed outfits when they leave the city for the Old West or the skyscraper lair of the enemy. It is genius marketing for kids and adults who will need to collect them all. But the film is also a lot more than a toy ad. The writers who had previously tackled a reboot of 21 Jump Street (I noticed a Teen Cop Movie in the city background at one point and wondered the connection) and Cloudy With a Chance of Meatballs spin an epic quest into the plot with well developed mini figure characters that mixes in laughs, potential tears and kid friendly hijinks that don’t delve into the common bowl of toilet humor a lot of other recent animated films have dipped into. It was a mix of The Matrix, The Lord of the Rings and a great franchise of interconnecting blocks that was written recognizing that kids are smart and in a way that their parents will love it too. I liked this movie a lot more than Cloudy with a Chance of Meatballs and Despicable Me (1 or 2) and they did a good job of setting up a sequel at the end to bring more to this universe. I recently saw a LEGO/Marvel special on DisneyXD, “LEGO Marvel Super Heroes: Maximum Overload” that was top notch as well. Nothing like good quality animation that makes me want to buy toys again! I wholeheartedly recommend The LEGO Movie and give it 4 1/2 bricks out of 5.